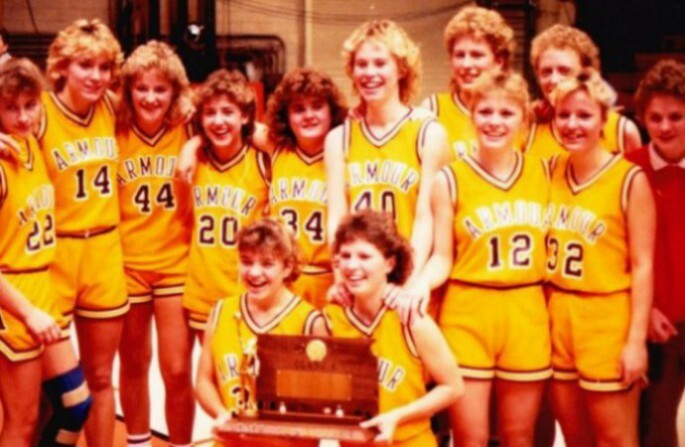 The Armour Packers of 1987, after winning their fifth consecutive Class B state girls title, were, from left, kneeling, Rita Freidel and Bonnie Hrdlicka. Middle, Jodi Pipes, Dana Nielsen, Jennifer Hawley, Tammy Weisser, Peggy Leonard, Christa VanZee, Meg Nase and Krista McFarland. And back, Michelle Kelly, Nicole DeVries and manager Amy Stern. 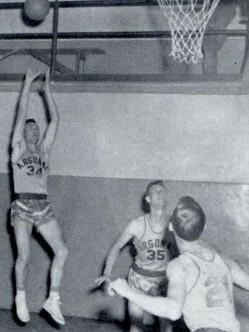 Delbert Gillam (34) scored 72 points in a single game for Argonne during 1953. The makeup of South Dakota high school basketball was changed dramatically when the controversial decision was made to discard the two-class system that had been in effect from 1936 through 1985. The 2016 Fall Newsletter of the South Dakota High School Basketball Hall of Fame examines the decision to change to three classes. Profiled is the man, Q.C. Miles, who played an integral role in the process. And included is a recap of the voting for the top players of the two-class era. Also featured are the Armour Packers and their five consecutive Class B state girls championships. The Packers compiled an overall 123-4 record while winning titles in 1983, 1984, 1985, 1986 and 1987. And the newsletter introduces readers to high scoring Delbert Gillam of the Argonne Arrows. His average of 25.9 points per game as a senior in the 1953 season included an amazing single-game record outburst of 72. 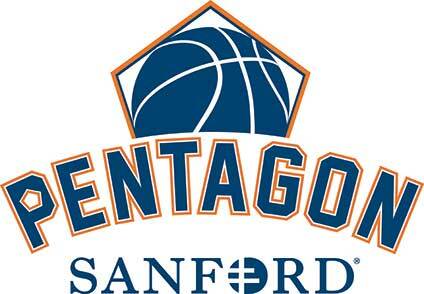 Those on the Hall of Fame mailing list were sent the newsletter on Nov. 16. We publish two issues per year and they are distributed free. I would like to be included on this newsletter mailing list. Thank you. When will you do the Deadwood High School – 1954 South Dakota “A” Basketball Champions?